From 1 October 2017, motorists in Singapore will be able to download the Parking.sg app on Apple App Store and Google Play Store. The mobile app is a quick and convenient way to pay for parking at all the 1,100 public car parks that currently use paper coupons (motorists need not use the Parking.sg app for short term parking at car parks implemented with the Electronic Pricing System). In the beginning, the mobile app can only be used for cars. It will be extended to motorcycles and heavy vehicles by the end of the year. In line with Singapore’s vision to build a Smart Nation, the Urban Redevelopment Authority (URA), Housing & Development Board (HDB) and Government Technology Agency of Singapore (GovTech) announced the development of the Parking.sg app in May 2017. Motorists can use the mobile app instead of coupons to paying digitally for parking. They simply have to key in their vehicle number, select the car park, indicate their parking duration and start parking. Motorists have to activate the app to begin their parking session once they have parked their vehicle, as enforcement checks by patrolling officers will continue to be conducted. The mobile app automatically calculates the charges that motorists have to pay based on 30-minute blocks. If motorists end their parking session earlier, they will receive a refund and will only be charged on a per minute basis. 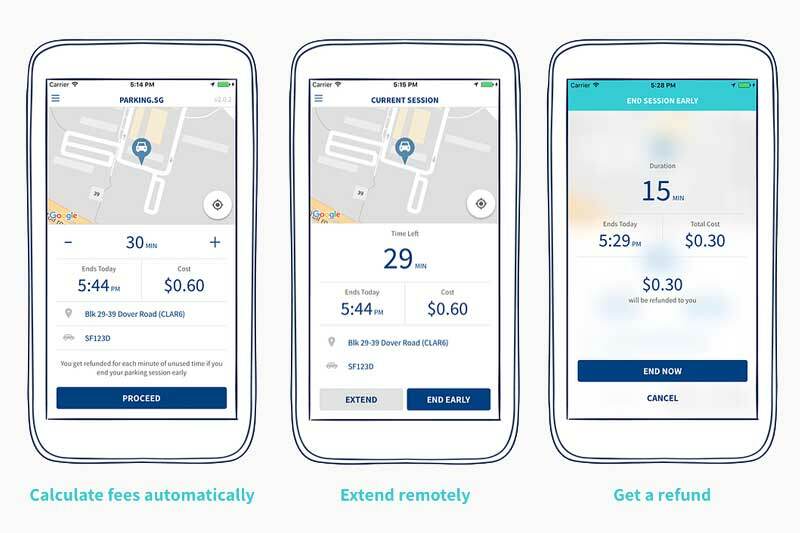 The mobile app will also prompt motorists when the parking session is about to expire so they can remotely extend the duration of their parking session, if required, at their convenience. Trials were conducted in two phases – from May to June and from July to September – to test the functionalities of the mobile app and its backend system to ensure their robustness to take a higher load of users. More than 15,000 public officers and selected members of the public participated in the trials. The agencies have since incorporated feedback gathered from the trials, and improved the mobile app for better user experience. For instance, they added the parking history and notification feature that alerts the user before the parking session expires. The development of this app has been described as an example of user-centric design. User feedback was incorporated early in the product development cycle through various trials and the product enhanced with new features along the agile, iterative process.